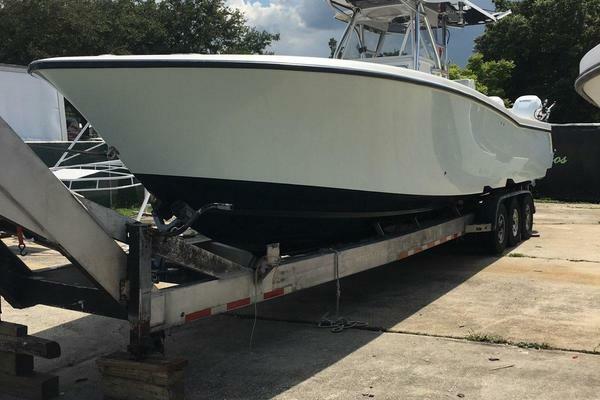 (LOCATION: New Port Richey FL) This Silverton 41 Convertible is a perfect example of how a vessel should be maintained. Extremely clean and full-featured, this convertible has spacious flybridge, large cockpit, open salon, galley with dinette, and two staterooms. Whether you are planning a day on water, a weekend getaway, or extended cruise, this 41' Silverton is ready to accommodate. On deck we start at the top with a flybridge with hardtop and full enclosure. The centerline helm station is equipped with Garmin 2010c color chartplotter, Sitex 90 GPS, Furuno 36 mile radar, Standard Horizon depth sounder, Horizon depth sounder, Ritchie 5” powerdamp compass, Robertson AP11 autopilot, and Standard VHF radio. Seating consists of twin helm seats with two guest lounges forward. Below is the large, deep, cockpit with in-deck fish boxes, transom door, swim platform, and room to spare. Wide side decks that lead forward to a foredeck with bow pulpit with anchor and windlass. The roomy salon is carpeted and comfortable. As you enter the salon you find a convertible sofa port side with barrel chair and the entertainment center starboard. The galley is forward and down and features a stand up Norcold refrigerator/freezer, Goldstar microwave oven, and U-shaped Corian countertop with Princess electric cooktop and large sink. Opposite the galley is a booth style dinette with seats four and converts to sleep two. The forward stateroom features a full berth, and two lockers. The port side guest stateroom has upper & lower bunks and hanging locker. The starboard head has vanity with sink and shower stall. Mad Hatter is powered by twin Caterpillar 420-hp engines with Algae X fuel units inline. A Kohler generator provides offshore electrical power and reverse cycle HVAC maintains interior comfort. This beautiful Silverton Convertible is well equipped, professionally maintained, and ready to fish or to cruise. Call now for more information and to schedule a showing. 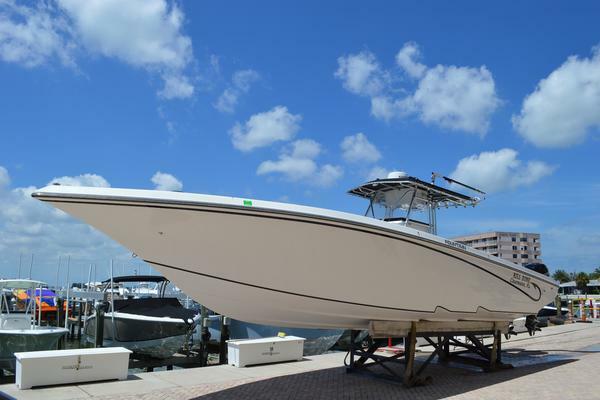 West Florida Yachts would love to guide you through a personal showing of this 46' Silverton 41 Convertible 1998. This yacht for sale is located in New Port Richey , Florida and priced at $119,000. For a showing please contact us by filling out the form on this page and we will get back to you shortly! The Silverton 41 Convertible starts by combining the finest designs with the best of modern engineering and manufacturing methods. There are no short cuts. Every inch of the 41's fiberglass hull is hand-laid. Every material is the best. Intelligent utilization of techniques like modular design, standardization, just-in time manufacturing, and economies of scale allow Silverton to lower costs without cutting corners. It also allows Silverton to offer Marine Pac, the largest collection of standard features and amenities in the industry - features you'd expect to find on larger, more expensive yachts. They include luxuries and necessities like hardtop over flybridge, swim platforms, trim tabs, bow pulpits, microwaves, anchors, and boat hooks. In addition to the standard features, Silverton keeps boating safety in mind. An automatic fire extinguishing system, life preservers and much more are all standard on the 41. Twin Caterpillar 3126 diesel engines - 420 hp ea.